If you like the worlds under the Sea, this is a piece for you ! 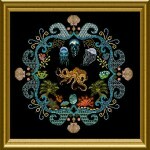 In the center a beaded Octopus is sitting to guard his treasures…. 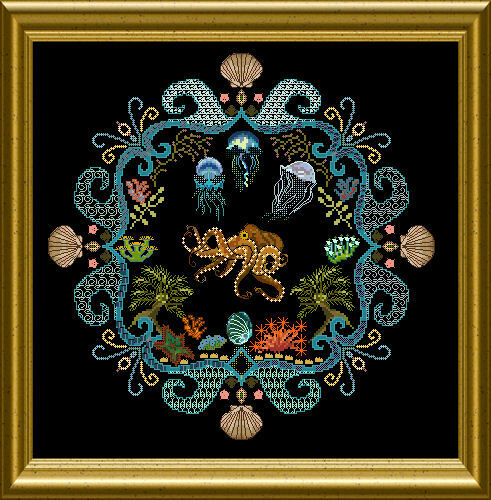 He is surrounded by waves of Blackwork and underwater bays, filled with the organisms of the deep sea: Corals, Polyps, Shells , Jellyfish and Starfish. You will use beautiful and different threads and materials, sparkling braids, beads and crystals. 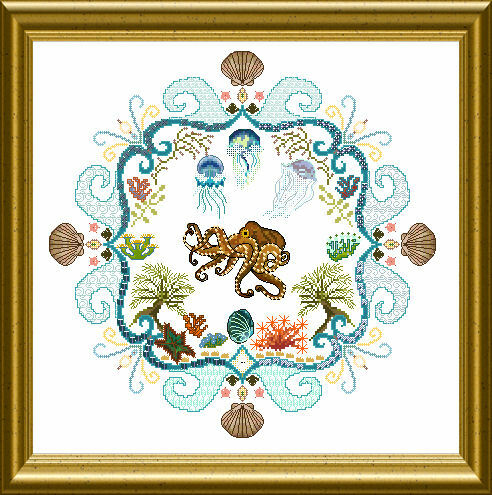 Special Stitches, Blackwork patterns, small stumworked shells will add to the normal cross stitch ! Is there a thread pack and embellishments pack for this chart? If so how much is it.